"Consecutive Candles" identifies instances when excessive amounts of candles have closed in the same direction. This type of analysis is interesting for both trend followers as well as swing traders. Autochartist keeps track of every instrument’s typical quantity of consecutive candles, and when an exceptional movement occurs, the trader is alerted to this event. Autochartist looks back up to 600 candles, for every instrument, for every direction, for Hourly, 4 Hourly, and Daily candles and generates a histogram of consecutive candles. That means we keep track of 5 distributions for every instrument. 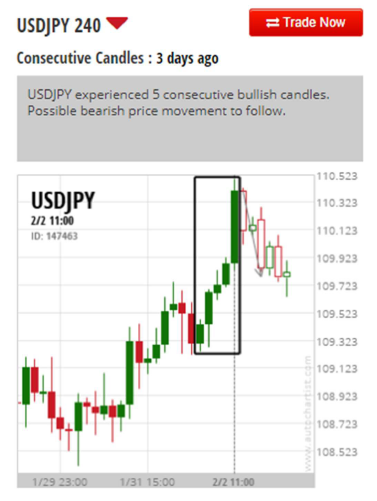 We can see from the above histogram, that over the last 600 candles, about 50% of the time we only get 1 “consecutive” bullish candles - meaning that over 50% of the time USDJPY H4 graph just alternates between bullish and bearish candles. We can also see that about 30% of the time, we get 2 consecutive bullish candles, and about 10% of the time we get 3 consecutive candles. That means that if the USDJPY H4 chart has 4 or more consecutive bullish candles it would trigger a “result” in Autochartist.